We have been asked many times if it is safe to travel to Japan or if it is safe to travel with children to Japan. Safety depends on the radiation levels in the area you plan to visit, what you consume and the risk factors for the people traveling. Radiation impacts children and pregnant women much more than it does men. Women who are not pregnant in general fall somewhere between the risk for children and men. More caution should be taken based on the person’s risk factor. 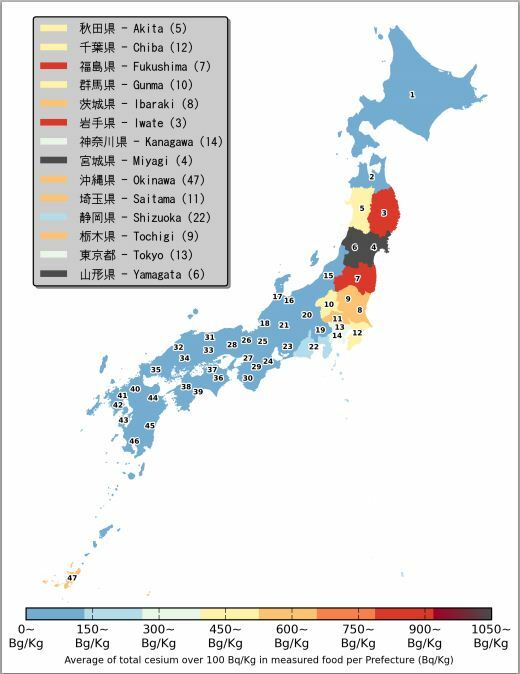 There are a number of resources that will show the current environmental radiation in cities across Japan. They are normally in microsieverts per hour or uSv/h. The pre-accident background levels in Japan are in millisieverts per year or mSv/year. 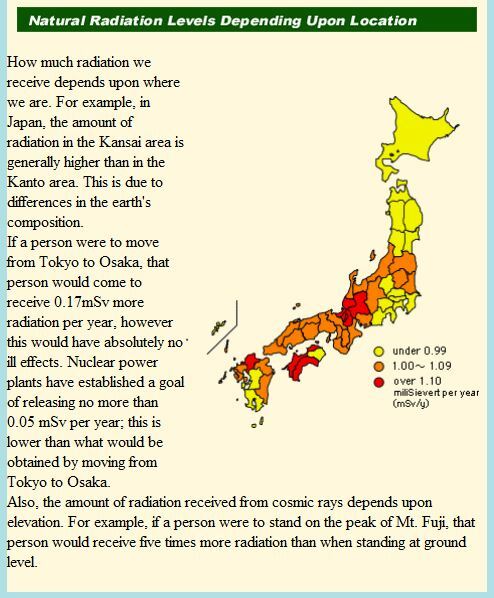 We will explain how to interpret the two so you can understand any radiation increase in an area you plan to visit. * millisieverts are 1000 microsieverts. 438 microSv/year equals 0.05 microSv/h. 0.119 microSv/h equals 1042 microSv/y or roughly 1 mSv/year which represents the natural background level. So the current levels in Osaka are at about normal background levels indicating no additional radiation contamination. .05 uSv/h x 8765.8 = 438.29 uSv/year or roughly, slightly less than .5 mSv/year. This is less than background levels. .261 uSv/h x 8765.8 = 2287.87 uSv/year or 2.2 mSv/year roughly just over double the pre-disaster background level in Tokyo but this is the higher end of the varied readings around Tokyo. There are of course higher levels being found in “hot spots” where radiation collects in the environment. 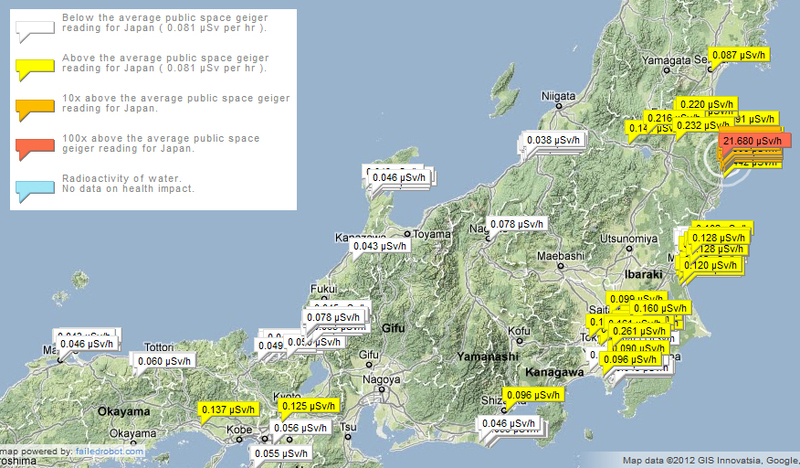 Live radiation readings taken May 2012 show the “per hour” reading in various areas. The environment is one risk factor for potential contamination, the other is what you consume. Eating or drinking substances contaminated with radioactive substances will cause internal exposure, something that can be worse than external exposure from the environment. Even in an area of little or no environmental contamination, food can be a risk factor. As with any modern culture food is shipped from various places or co-mingled with food from many sources. Knowing the source of what you are eating, sticking to things lower on the food chain and food of better quality can help lower risk. This chart shows food contamination levels in a spreadsheet for early 2012. Try to know where your food came from. Imports, food from the far south and west is less likely to be contaminated. Try to find food that has been tested, some producers and retailers are testing and showing results to prove food is safe. Produce is frequently labeled with the production location, these have been faked by some unscrupulous sellers in rare instances, using a food source you trust or that tests lowers your risk. Aeon grocery stores and many food coops are testing food and only accepting no contamination products. In situations where you can’t research food like restaurants, looking for quality can help lower the risk. It is commonly assumed that low quality foods are more likely to have questionable ingredients in them. Highly processed foods, things like convenience store prepackaged foods have been mentioned as possible risks. Seafood from the Sea of Japan tends to be less likely to be contaminated, as is Lake Biwa. Seafood from the eastern Pacific holds more risk of being contaminated. Eating lower on the food chain and from safer areas will help lower risk. Formula and baby foods could be brought from home to side step the risk issue. Distilled water would be preferrable to tap water, distillation removes potential contaminants. Reverse osmosis water also would have most contaminants removed. Both are typically available as bottled water in most countries. Practicing good hygiene and housekeeping habits can also lower exposure if you plan to be in a contaminated area. Leave shoes outside or in an entryway to keep contaminated dirt out of inside spaces. Wash hands before eating or putting anything into your mouth with your hands. If conditions are dry and very windy a non woven pollen mask can be worn to block contaminated dust and dirt from being breathed in. A simple N95 dust mask is suggested by various groups in Japan as being sufficient to block contaminated dust and dirt that can be blown around. If you plan to be in an area with some contamination packing a few of these may be of use. They also block pollen. *check our pages for updates on food contamination as we receive them.